What Is The Fur Council Hiding? Lifeforce has yet to receive a response from the Fur Council of Canada to our letter on December 5th, and has sent a follow up letter. In the 90s the Vancouver-based ecology organization Lifeforce documented cruel animal shipments between Hawaii and Vancouver, BC. An average of 2000 cattle are shipped over eight days in filthy conditions. They are forced to live in their feces and urine. Further investigations found that in 2007 the shipments continue. This video depicts the story of one who suffered - one who tried, in vain, to escape. The Vancouver-based ecology organization, Lifeforce, has sent a challenge to the Fur Council of Canada. We requested that they allow our representative to film the December "pelting" of mink and foxes on fur farms. Nearly two million animals will be killed this year. The Fur Council has recently launched a $1 million marketing campaign that attempts to sell fur as eco-friendly. On November 21st the City of Vancouver's Urban Design Panel voted 4 to 1 in non-support of the Vancouver Aquarium's Development Permit Application. The Aquarium will probably go back to the Urban Design Panel on Jan. 16, 2008. On November 21st the City of Vancouver's Urban Design Panel voted 4 to 1 in non-support of the Vancouver Aquarium's Development Permit Application. Normally the process stops and the Aquarium will have to redesign to address issues. Lifeforce reveals the hidden cruelty of the Rodeo industry. The public is unaware of the behind the scenes abuses. The bucking straps are cinched tight to make the animals buck (they stop bucking when the straps are released), they are shocked with electric prods, their hair is twisted and sometimes pulled out, they are jabbed with spurs and more. Numerous animals have died from these rodeo practices. In addition to the adult games Lifeforce was saddened to see how the very young kids were treated in Little Britches Rodeos. Some were crying and some were injured. They were not having fun. Parents have to sign a waiver for "injury or death". It was shocking when in 2007 the Japanese dolphin killers attacked protestors by using their boat engines. The Vancouver Aquarium's hired guns did the same to Lifeforce volunteers in 1990. Maybe VA sent the video to their business associates in Japan- Dr. Huff and John Ford sat in their boat and took video of the outboard engine attack.I ask them to stop the attack but they wouldn't (presence of the CBC camera stopped it). Click HERE to view the full video footage. Out of public view there are over 1.6 million animals suffering on Canadian fur farms. The most common animals being farmed are mink and foxes. Calling it farming is an attempt to create an idyllic image of happy animals running around the pasture. But the reality is that the animals are inhumanely confined to tiny cages and exhibit abnormal, neurotic behaviors. Click HERE to read the full Lifeforce Fur Farm Investigation. Click HERE to view the Lifeforce investigation video footage. Lifeforce releases our 2007 News Update, where you will find updates about our many programs, including our latest campaign "Furgotten" in which we expose fur farming in Canada. Click HERE to read the full 2007 Newsletter. Thank you to all Lifeforce volunteers and supporters for your ongoing committment to our fight to protect animals and the environment. The five Makahs who violently murdered a grey whale should be prosecuted to the fullest extent of the law. Their cruelty caused a slow, agonizing death of a sentient whale. It was a blatant crime against nature. So what happened at the PNE Pig Races? : Click HERE to find out. Update: Click HERE to read an important update on this issue. 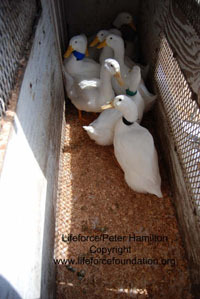 The Lifeforce investigation of Richard's Racers (pig and duck "races") exposed numerous animal rights violations at the Abbotsford Agrifair and Rodeo from August 2 - 8. Lifeforce sent a letter to the Pacific National Exhibition (PNE), city officials and Safeway (a sponsor) in which we outlined our concerns and urged them to cancel this performing animal act. Lifeforce investigation video being updated. 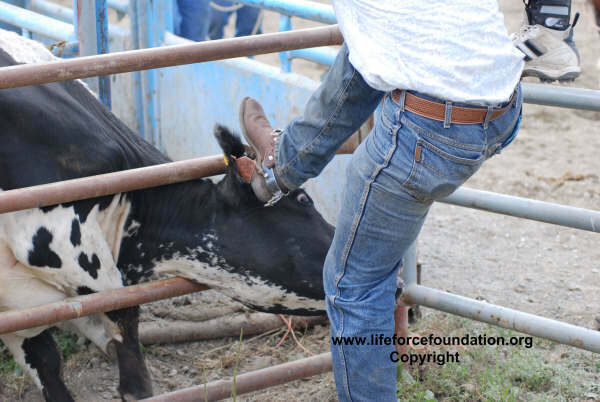 Lifeforce was sickened to see the brutal treatment of animals at the Chilliwack Rodeo this weekend. In particular, Lifeforce took photographs of a steer that stuck her head through the fence and was repeatedly kicked in the face. When this "reserve" steer was in the chute she had put her head back and forth through the bars several times and there was no need for such violent, wanton abuse. 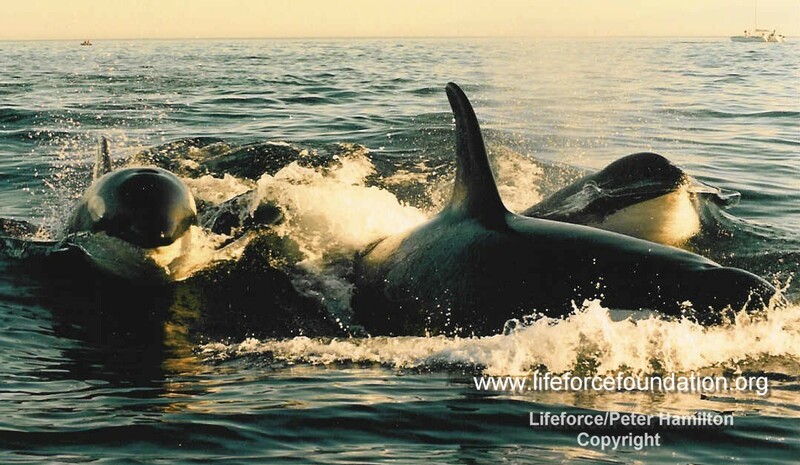 Lifeforce has sent two emails to DFO's West Coast Division, in respect to the fuel spill at Robson Bight and implementing methods to protect designated endangered orcas known as the Northern Community. Lifeforce has not received any response. Click HERE to read the open letter to officials. Lifeforce, the Vancouver-based ecology organization, has developed methods to keep orcas away from environmental hazards such as fuel and oil spills. Lifeforce Director and Researcher, Peter Hamilton, has advised officials that he can provide this specialized service if the spill cannot be immediately contained and cleaned up. Lifeforce calls for day off for orcas. One of the best ways to stop boat harassment is to give the orcas a day off and breaks during the day. Humans don't want to work continuously so why should commercial whale watch vessels and research boats be allowed to pursue orcas from sunrise to sunset? It's time for whale watch and research regulations. It's time to give orcas a break. The Lifeforce Image Gallery has a wide range of photographic images of violations of animal rights. We will still be adding many more still images and we hope to add video images. In particular, the album with vivisection images represents experiments that continue today. In many cases the same vivisectors are conducting the same experiments. Investigator, Peter Hamilton, was not only was able to obtain hundreds of photographs but also filmed the atrocities. Although we got a few minutes of the motion pictures aired on television and in various film/video productions, it was not possible to get all the images to the public. Now, with the advent of new computer programs and the internet, we can reach the masses. We can show present and future generations what is (and hopefully was) behind the closed doors of vivisection laboratories. As the saying goes " A picture is worth a thousand words" but video gives a much stronger message. The Lifeforce documentation now has to be transferred from film to a digital format so we can put all the hours of images into the Lifeforce Image Gallery. Lifeforce is hoping to raise $7500.00 to put the footage online and to create a Film Library. We also would produce some short video clips to counteract current fundraising attempts for vivisection, such as spinal cord and heart experiments on animals. Most of the public is not aware of the continued vivisection and this will raise public awareness of how their donations, government tax monies and scarce health care funds are being spent. Click HERE to see samples of videos that continue today. "Behind Closed Doors" and "Pound Seizure". Your financial support would be greatly appreciated. Please send your donation to Lifeforce, Box 3117, Vancouver, BC, Canada V6B 3X6. Canada's Orca Recovery Plan that was released last week falls short of providing immediate protection for endangered orcas. There are no immediate plans to stop negative boat traffic and to respond to emergencies such as oil spills. There will also be an increase of research boat traffic harassing the orcas. Please note that there is now a 60 day comment period on the killer whale "strategy" (June 21 to August 20, 2007). Send in your comments to protect the orcas. It's the time of the year that wildlife protection organizations, such as Lifeforce, a Vancouver-based ecology organization, get inundated with calls about seal pups on the beach. If people remember these simple rules then it will be a lot less worries for all - especially for those baby seals who are often needlessly separated from their moms. Peter Hamilton, of the Vancouver based ecology organization Lifeforce, is pleased to hear that the Vancouver Art Gallery will finally remove all animals from the controversial exhibit "Theatre of the World". Lifeforce implemented a letter writing campaign to the Management and Directors of the Art Gallery. We also urged people to tell the SPCA to immediately seize the animals because the SPCA agreed that the captives could die. "The species are from different ecosystems and are subjected to a forced predator/prey relationship. Society must not condone promoting violence and cruelty in our society and to other sentient creatures, stated Peter Hamilton, Lifeforce Director, "Forcing animals to fight is not art, it is sadistic". Vancouver has been a leader in recognizing Animal Rights Day and implementing animal protection laws. If the Vancouver Art Gallery curators continued this cruelty, they would be impeding the progress towards developing a compassionate society for all life. BCCTV reported that the Art Gallery would keep the "cage" in the exhibit as a "protest". Our response is that it is unfortunate that the Art Gallery doesn't fully respect the rights of animals. If they keep the death trap, they should paint it red in respect of the animals who would have died. However, they should remove the offensive cage and deem the space a "Memorial Against Animal Cruelty". Although organizations have failed to convince government to ban breeding, selling and keeping exotic animals Lifeforce has been sucessful in stopping the exploitation of tigers/threat to public safety through bans in shopping malls and pubs. ownership of dangerous animals such as tigers, lions, monkeys and alligators. example of the threat that these animals pose to society. conditions. The tiger’s owner, “magician” Kim Carlton, used to live in Abbotsford and kept a tiger in his carport. Burnaby’s ban on such animal performances (we also convinced the mall to not rehire the International Lion Show that promoted getting a photo with lions). In addition, Bridgeport and other shopping malls stopped hiring National Animal Agency with tigers and other large cats for photo gimmicks. Lifeforce also helped stopped the exhibit of Carlton’s tigers and a lion at a Whistler pub in 2005. We were also able to instigate a ban on performing animal acts in LCB licensed establishments which stopped shows such as the stripper Jane Jones act with a tiger. performances. In order to protect people and animals BC and Canada must also ban the sale, ownership and breeding of exotic animals. Read the Lifeforce Letter sent to Premier Gordon Campbell requesting changes to the BC Wildlife Act. TEAR DOWN THE WALLS OF DECEPTION! For over 50 years, people and organizations against vivisection have been hitting their heads against the wall of vivisection ignorance and deception. In April, organizations throughout the world will speak out against vivisection and Lifeforce will introduce new campaigns. These campaigns will expose the plight of animals in vivisection labs and the misleading results that harm people. We hope to tear down the wall of vivisection deception by exposing the cruelties and the scientific fraud. Our photographs show the ongoing animal abuses. And our scientific literature proves that "animal models" do not represent human maladies and animals respond different to methodologies tested. There is a growing array of non-animal research methods rendering vivisection increasingly obsolete. The animal experiments conducted today could be eliminated with the implementation of non-animal methods without risk to human health. However, the multi-billion dollar research, drug and chemical industries are entrenched in animal research for economic, legal and political reasons. The "old school of medicine", industry lobbyists and special interests groups perpetuate the myth that animal experimentation is necessary in spite of the fact that it is futile and barbaric. There propaganda implies that people will die without animal experiments when, in fact, vivisection risk human lives and deplete scarce health funds. 1. Three Es - Experimenting section of photographs depicting research practises that continue today. 2. Vivisection eProtest - Cards and Posters to send to Politicians who can implement legislation to phase out vivisection and Health Organizations that can stop funding vivisection. 3. Lifeforce Online Store includes Anti-Vivisection Stickers and Books/Critiques Against Vivisection. Lifeforce and all those oppose to vivisection have the hope of ending the misery and pain for animals in laboratories and at the same time, improving human health. Supported by thousands of animal advocates, physicians, veterinarians, scientists, and healthcare reformers, we will challenge the animal research industry's propaganda with hard facts. Science and our ethical relationship with all living creatures must progress beyond shameful and scientifically fallacious vivisection. The Vancouver Art Gallery exhibit with live lizards, toads, scorpions, tarantulas, cockroaches, millipedes, and a snake subjects them to unnatural living conditions and cruelty. The installation entitled "Theatre of the World" is basically a two-metre-long plywood-and-wire-mesh cage that does not provide for basic behavioural and psychological needs. The species are from different ecosystems and are subjected to forced predator/prey conditions. Society must not condone promoting violence and cruelty in our society and to other sentient creatures. Forcing animals to fight is not art it is sadistic. Speciesism is as abhorrent as racism and sexism. A speciest has no ethical boundaries and does not draw any moral line between a bug or a bunny or a beagle. Violence perpetuates violence. Violence towards animals also leads to violence towards people. Where will it end if you condone this? A new Vancouver Art Gallery exhibit with live lizards, toads, scorpions, tarantulas, cockroaches, millipedes, and a snake subjects them to unnatural living conditions and cruelty. The installation entitled Theatre of the World is basically a two-metre-long plywood-and-wire-mesh cage. "The species are from different ecosystems and are subjected to a forced predator/prey relationship. Society must not condone promoting violence and cruelty in our society and to other sentient creatures, stated Peter Hamilton, Lifeforce Director,"Forcing animals to fight is not art, it is sadistic". Open letter regarding the Stanely Park Restoration and Federal Funding. park. It would be illegal to spend it on commercial development. opportunities to build zoo attractions. History must not repeat itself. wildlife habitats - not on commercial development and more animal prisons. Since Stanley Park is a National Historic Site any such restoration plans are subject to a Federal Environmental Impact Study prior to any final approval of restoration plans. experiences for present and future generations.